Because this is a simple and straightforward basket it may appear to be lacking in sophistication, whereas in fact it is a basket of great finesse. It embodies an idea of utility. 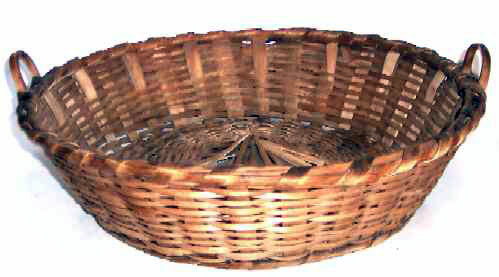 This particular basket also has a coiled piece of splint which forms a foot on the bottom of the basket to protect it. While this detail is very common on Indian baskets from the northeast it is less common on non-Indian baskets. Sturdy construction, a wonderful patina and excellent condition make this basket a very desirable addition to any collection or a perfect stand-alone piece. It is of a great size . . . 15" in diameter x 3-3/4" high.